Here is a website full of hilarious short films. I met this man at a Final Cut users group meeting last night. Go to Mitchell's site and see his stuff. Make sure you see at the very least, "Case Studies from the Groat Center for Sleep Disorders" and "Learn To Speak Body: Tape 5". Though all of his stuff is great. When you drive through Hollywood, you see many interesting things. 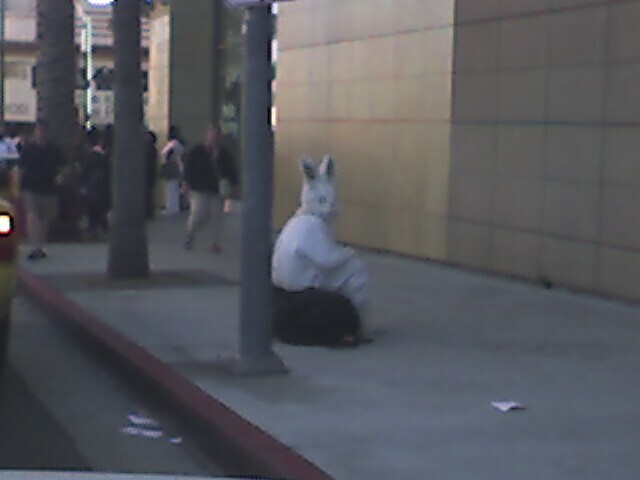 This was taken by Chana from our car (please forgive the phone-camera quality) at the corner of Hollywood and Highland, in front of the Kodak Theatre. He was sitting on his duffle bag and waving to people as they walked by. Most people gave him (it?) a wide berth. I've seen him (we'll call him "Mr Mangy Rabbit") down there once or twice since then, and his act has been pretty much the same everytime. It doesn't add up, since all of the other street performers stationed there are doing amazing feats. Maybe I'm catching him during breaks all the time? Maybe he has special tricks he does. Perhaps he juggles, twirls fire, or has a team of trained pomeranians in his bag. I may never know, 'cause he's always sitting on that duffle when I'm there. I could speculate for hours, but no one needs to read that. Next time you're in Hollywood, drop by to see Mr. Mangy Rabbit and tell him I said "S'up Doc?" 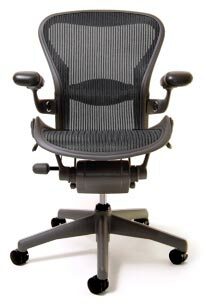 I sit in an Aeron chair (like the above) everyday at Warner Bros. It's funny. They seem to have them everywhere except in the bathroom stalls. I'm used to them, and I think I love them. Unfortunately, my home studio furniture budget ran out when it came to the chair, and since I'm sitting in this "Office Depot Special" at least as much as my WB chair, my body thinks it's being punished half of the time. When I was starting to learn the drumset, I was proud of every cool new beat or crazy fill I learned (either from lessons or from drummer-friends). At the age of 16, I thought it was important everytime I sat behind the drums that everyone hear them ALL, without regard to what the other musicians happened to be playing. It seemed understood that they were there only as a vehicle for me to showcase my stuff. Thankfully while playing with many musicians through the next few years of high school and college, I learned that this style wasn't necessarily what everyone was looking for. "What? If you've got the chops, flaunt 'em", I thought. Soon enough (and to the joy of all who played with me), I started learning what PLAYING FOR THE MUSIC was all about, and how it began to shape my style and approach. 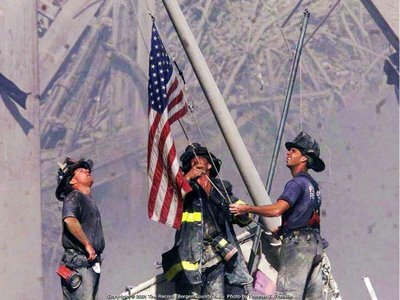 I grew to love the concept behind having the ability to go nuts, and the control over knowing WHEN, IF EVER, to do that. PLAYING FOR THE MUSIC - v. The act of playing one's instrument in a manner suitable to the musical style of a song or arrangment, without drawing attention to one's self by adding supposedly impressive musical embellishments in an non-supportive way to the other players during the song or arrangement. This does not include the sometimes called-upon act of playing an instrumental solo (a.k.a. "taking a ride") during a pre-arranged portion of the piece. The point: What does the song need? 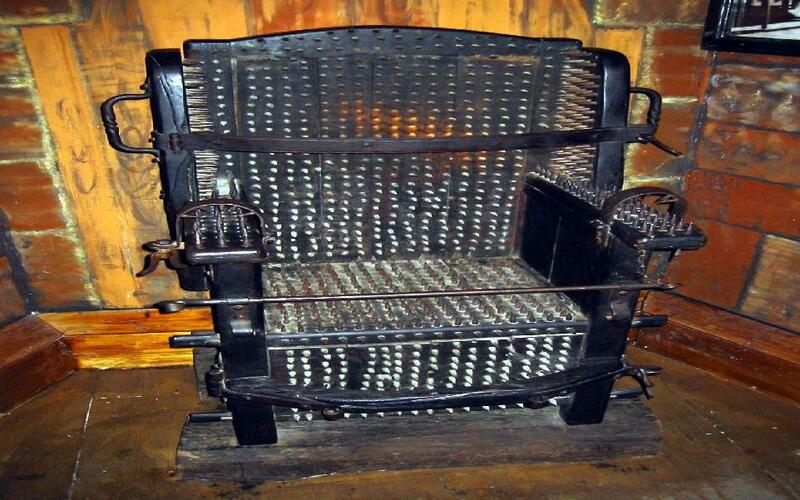 What is it asking for? Meat and potatoes, or salsa and jalapenos. If the part you're playing is too boring for you, then spice it up with some good timing, or a zesty portion of feel. Just how fat can you make that backbeat? What is (or what should) your hi-hat be doing right now? Are you and the bass player locked in? Not all of your parts have to cook in the same way. Sometimes the most impressive thing you can do is stay out of the way of everyone else. Don't think I'm not any fun, because when the song calls for big fills and heavy chops, then you better deliver or you'll be out of place all over again. The trick to learning good drumming 'taste', is by listening to great drummers - a lot. What are they doing in the song? How are they treating it? Are they putting down a good foundation and playing fills that match the style of the song, or are they in their own world, filling every possible space with a flurry of meaningless fluff. It's not really that hard to tell if you pay attention. Sometimes, when I am out listening to a band, the only phrase that goes through my head is "Too Many Notes". Important: Making me think this is not your goal. As I get older, my chops aren't what they used to be in my 20's and 30's. (though, they ain't half bad either) But, I do feel like I'm a better player because of 'taste'. For me, it's something that I hope to nurture 'til I can't play any longer. If you think you may be an offender of these rules (and we all have at some time), just remember there are legends that have also been accused of using "too many notes", so there's hope for you. 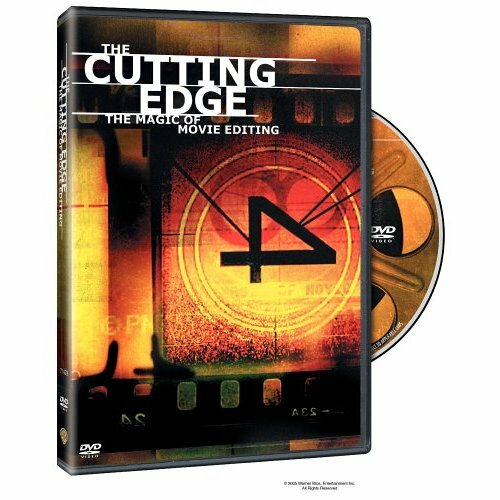 I double-checked, and I was actually surprised to find that I have not blogged about "The Cutting Edge - The Magic of Movie Editing" yet. 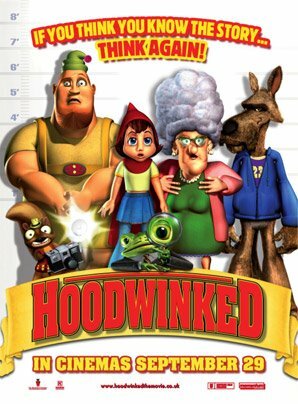 I first saw this documentary around Christmas '05, have watched it a few times, and have since then bought several copies of it and given them away. In short, it is a terrific history of the profession of movie editing. It discusses the first editors, and the risks they took to push forward the craft. It talks about the studio system of old, and how editors have come from the chop-shop cutter, to the director's right hand in post-production. Today, film editors have unprecedented say and creative input in the making of a movie - but it wasn't always so. That said, I still highly recommend this film as an 'editing history and techniques primer', as well as a look at today's best editors and directors giving their insights into movie making and the working relationships they share. 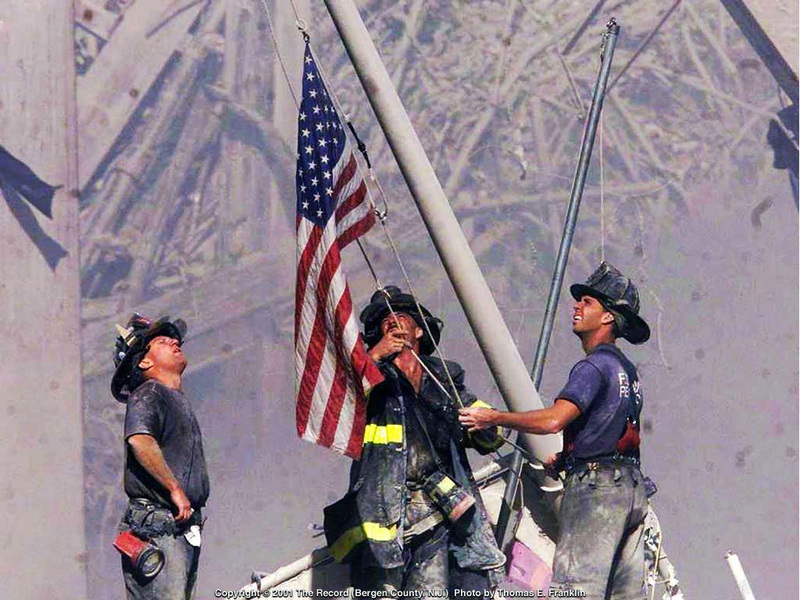 Check out this documentary if you haven't already seen it. It will inspire editors to further greatness, and compel those who aren't editors to become one. I used to be a member of PAS (Percussive Arts Society) when I was in school at North Texas. It was a great resource for information, but I really liked it because we took the NT drumline to the conventions every year to compete. Those were some fun road trips. One year, my friend Dale Baker and I drove the equipment van up to St Louis. Good times. We won that year for an unprecedented four titles in five years. Anyway, It's been forever since I've been on their website. I went tonight and found some really interesting stuff that took me back to my college days. 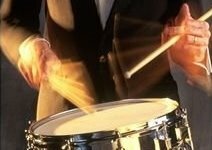 THIS PAGE is full of links to drumset, marimba, snare and timpani patterns similar to what we used to play for warm-ups on those instruments. The music is written out and there are nifty audio files you can play right from the page to hear them played down. They are created with cheesy keyboard samples, but the exercises are still good and challenging. There is also a page with all 40 standard drum rudiments (there were just 26 in my Jr. High days). They are the cornerstone of all drumming; as they deal with stick control and precision. So, get out your practice pad, your metronome, and your marching sticks. Remember to keep all your fingers on the stick. Bend mostly at the wrists, not the elbows. When possible, count out loud. Now, doesn't that sound nice? 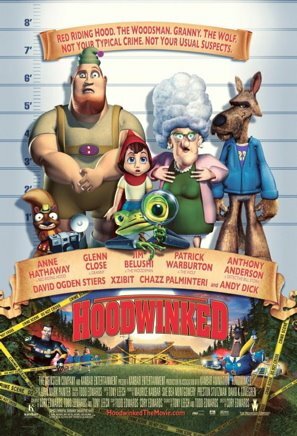 One of the most fun projects I have been a part of to date, "Hoodwinked" is opening in the United Kingdom on Sept 29, 2006. [Above] I found this UK “Hoodwinked” poster. I immediately noticed the simplicity in comparison to the US version [below]. There are no actor’s listed, no production credits, and there’s a lack of background graphics clutter like in the US poster. Anyway, it’s a very fun movie, so if you never got to see it in the theaters in the US, and you can’t find a Walmart to buy the DVD, then just go and see it “Brit” style with all those jolly chaps and bonny lasses across the pond. It’ll be worth the cost of your airline tickets, security probes, and sodas sans ice. The director, Cory Edwards, went to the UK and promoted it for about ten days or so. Check out HIS BLOG to read about his adventures there. Also, consider showing him your support by going to one of the theatres in Britain on opening weekend. I would go, but I’ve seen it and I have the DVD too, but I still think you should go and stuff.